Russian President Vladimir Putin said that for the purpose of political settlement in Syria, Russia, Europe, and the United States should be encouraging Syrian political forces to work jointly within the country. "If we want to be effective and not just shoot and carry out missile airstrikes, but want to achieve an actual political resolution, we need to encourage all forces inside the country - the conflict is complicated and multifaceted - to do joint work between different forces in the territory of Syria itself," Putin said when speaking at the VTB Capital 'Russia Calling!' 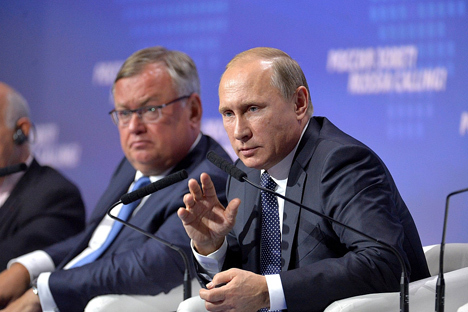 Investment Forum in Moscow on Oct. 13. "And this is the main thing. We need to work with people that we have influence upon - us, the United States, Europe - on order to have them negotiating at the round table and finally start the process of political resolution. This is the point that we haven't reached yet in our joint work with the United States or Europeans," Putin said.